Prime Minister Vladimir Putin fears he'll be the next strongman to fall if Russia allows the UN to take action around the world, one of the country's opposition leaders said Wednesday. Russia vetoed a UN Security Council resolution against Syria because Prime Minister Vladimir Putin fears he'll be the next strongman to fall, one of the country's opposition leaders said Wednesday. "He believes that Gadhafi was in the past, Mubarak, now Assad, and next it will be Putin. That’s why to protect Assad means to protect himself," Boris Nemtsov said at a news conference in Ottawa, referring to former Libyan leader Moammar Gadhafi and former Egyptian leader Hosni Mubarak. Nemtsov, a former deputy prime minister who's leading Russia's democratic opposition to Putin, said Russia is going against the Middle East with its UN Security Council veto. Last weekend, Russia and China vetoed a resolution to endorse the Arab League's plan to transfer power from Syrian leader Bashar al-Assad. Nemtsov said the veto was to help protect Putin from future action by the rest of the world. "This is not about strategy, no strategy at all. This is how to protect himself." Putin was president prior to being prime minister and is running for president again in a March 4 election. But thousands of Russians have been gathering in near historic numbers to protest Putin. Last December's parliamentary election was widely viewed as being rigged in favour of his party. CBC News has learned senior Canadian officials have in recents weeks been pressing their Russian counterparts to at least halt arms sales to Syria. With the Russians reluctant to be seen supporting international involvement in Syria, Canadian officials feel an arms embargo would send a strong signal to the international community that Russia does not condone the Assad regime's actions. The issue was to be discussed with authorities in Moscow. The UN Security Council veto has the benefit of looking anti-American, Nemtsov said, which plays well among Russians outside of Moscow. 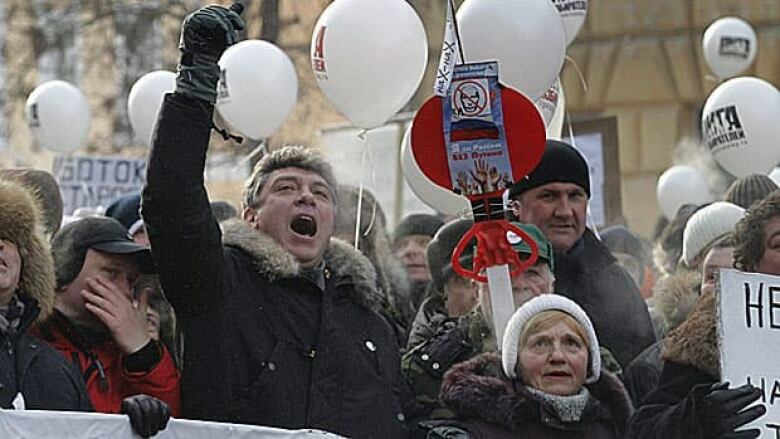 "We see that this [veto] is against Russia's interest," Nemtsov said. "If [the] Arab League supported this resolution and Putin's Russia is against, it means that we are against Arab world, which is disaster." Liberal MP Irwin Cotler, who brought Nemtsov to the press conference, has a bill in front of the House of Commons that would condemn corruption in the case of Sergei Magnitsky. Magnitsky was a lawyer who uncovered the biggest tax evasion in Russia's history but died in prison, possibly of torture. Nemtsov called for Canada to speak out — in part, he said, to show Russia's bureaucrats that the western world in which they love to travel doesn't approve of corruption. "If you will be honest and frank and say that 'this is not an election, guys.'... If somebody in this country would say so, it would be helpful." Cotler has asked Foreign Affairs Minister John Baird to adopt it as a government bill, and said Baird is reviewing it. "‪We will be watching the upcoming round of elections and expect that each vote cast legitimately be counted fairly," Rick Roth said. UN vetoes on Syria resolution 'disgust' U.S. ANALYSIS | Who wants to take on Vladimir Putin?